For starters, content marketing is not exclusive to the web, it can be any marketing platform. It’s includes the creation and sharing of media or publishing content whose purpose is to acquire more customers or conversions. There are many different ways you can display content, including text, photos, videos, e-books, case studies, white papers, infographics and more. While this is the general definition, something you also need to consider is the character your content carries. With Google’s algorithms changing constantly content has evolved greatly. People are searching more, asking more questions, what you need to ask yourself is, “Am I answering their questions?” Companies in every industry and size have various content strategies. 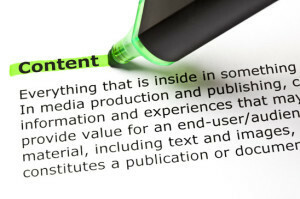 From Fortune 500 companies to startups the proof is in the content, not the pudding. While there are many different ways to market, you’ll definitely be able to find a way to use it to your advantage and boost your online presence.